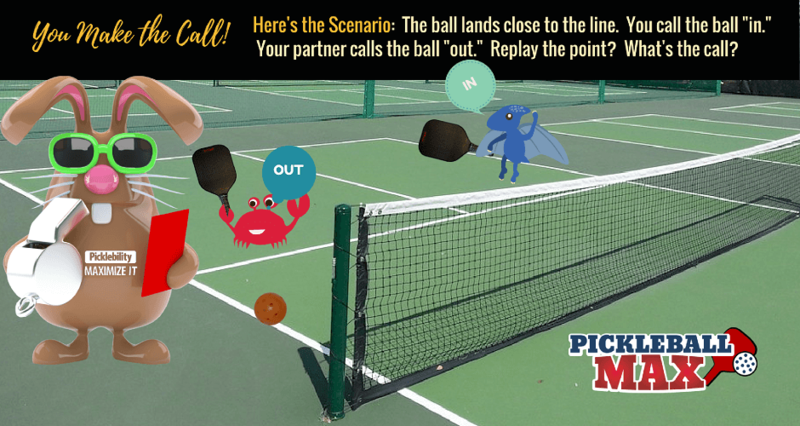 You are here: Home / Rules / You Call it “Out,” Your Partner Calls it “In” — Replay the Pickleball Point? What’s the Call? The ball lands close to the line. You call the ball “out.” Your partner calls the ball “in.” Replay the point? What’s the call? It happens all the time. Your pickleball nemesis hits a shot that lands really close to the line. You clearly saw the ball “out.” Or maybe — just maybe — you were hoping that the ball would be out. However, your partner calls it “in.” What do you do? Overrule your partner and take the point? Certainly a tempting option. Replay the point? Seems logical. Give the benefit of the doubt to your opponents? Yikes — afterall, it is your nemesis. It has been my experience that many will inappropriately replay the point. In this scenario, however, the point should not be replayed. Rather, the benefit of the doubt should be given to your opponents. So, in this case, grit your teeth and give the benefit of the doubt to your nemesis — and hope and pray they’ll do the same for you! The opponent gets the benefit of the doubt on line calls made. Any ball that cannot be called “out” will be considered “in.” A player cannot claim a “let” because the ball was not seen or there is uncertainty. Your opponent serves ball to you, you return the serve but your playing partner calls the serve long or out of bounds. Does play continue ? Rule #6.D.8: All “let” or “out” calls must be made “instantly”; otherwise, the ball is presumed good and still in play. “Instantly” is defined as calling “let” or “out” prior to the ball being hit by the opponent or before a dead ball is declared.